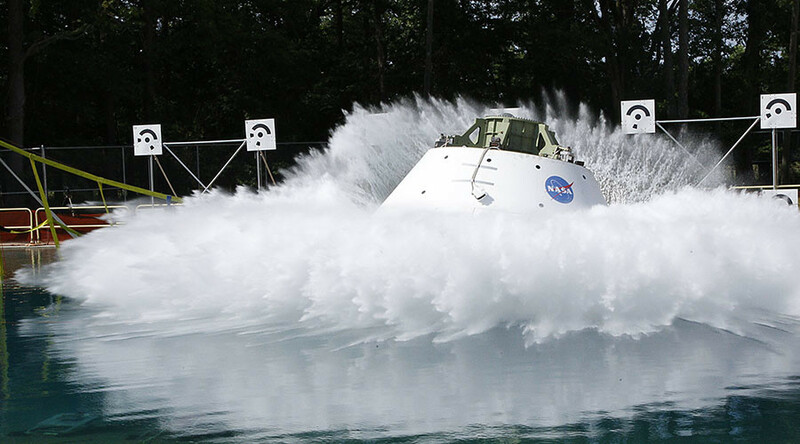 NASA has completed an important step in its quest to send a manned mission to Mars and back, by simulating a water landing with a model Orion spacecraft. The test was carried out to assess the impact on the module and how it would affect a crew on board. Suspended from a giant pendulum at NASA’s Langley Research Center in Virginia, the mock spacecraft was dropped into a pool of water, with the splashdown being greeted by cheers from the small crowd that had gathered to observe. He added that the water test is of particular importance because the forces that hit the craft during splashdown determine more than half the design of the structure of the module, which is vital for the safety of the astronauts. The mock landing took place under the most stressful scenarios possible. All three of the spacecraft’s parachutes had failed, which meant that Orion would approach the water at a much faster speed than planned. The test at the Langley Research Center had the spacecraft approaching the water at a speed of about 32 kph (20 mph). The normal speed if everything was functioning properly would be 27 kph (17 mph). Over 500 sensors were used to collect data from the impact, which included information about the amount of stress put on the heatshield and the aluminum cabin. Crash test dummies were also inside the spacecraft in order to test safety designs. NASA’s Orion program will eventually look to send astronauts into space in 2023. One unmanned flight was conducted in 2014, which saw the spacecraft splashdown in the Pacific Ocean, while another unmanned mission is scheduled for 2018. No date has been set for a future mission to Mars.